Akshay Kumar and Ranveer Singh are real entertainers, hands down. Karan Johar hosted Akshay and Ranveer in today's Koffee With Karan episode and oh boy, what a show it was. It was wild, whacky and fun, just as Karan had promised us previously. They ruled every minute of the show and kept us entertained thoroughly with their sense of humour and wit. After the scintillating revelations by Deepika Padukone and Alia Bhatt in the first episode of Koffee With Karan, in case you thought Ranveer too had some gossip in store for us, sorry to disappoint you, there was none. Nevertheless, the episode was fun and here are highlights from the second episode of Koffee With Karan. Karan Johar confesses he is a mumma's boy! Host Karan Johar, before inviting the desi boys to the couch confessed that he is unabashedly a mumma's boy. "I am obsessed with my mother and I extremely love her," said the 46-year-old filmmaker. Saying that, Karan shared an incident from the time when he was about to direct his debut film Kuch Kuch Kuch Hota Hai and his mother, Hiroo Johar, wakes him up on the first day of shoot and said: "You really know where to put the camera, do you?" If you watched today's episode you should have noticed how much Ranveer seems to idealize Akshay Kumar. So, when Karan Johar showcased a photo of Ranveer from when he was very, very young with none other than Akshay Kumar, the Befikre actor shared a trivia behind the picture. Ranveer revealed that the photo was taken on the sets of 1998 film Keemat, which also featured Raveena Tandon. He and his cousins had visited the sets of the film to catch a glimpse of the actor and that's where the photo had been taken. Akshay also shared that he and Ranveer have a lot in common. Ranveer Singh wants to work with Taimur, Kareena are you listening? During the rapid fire round when Ranveer was asked with which of these Khan's - Shah Rukh Khan, Salman Khan and Aamir Khan - he wants to work in a film, his prompt reply was Taimur. Ranveer said that he wants to be cast as Taimur's father in a film. Ranveer Singh's worst habit as a boyfriend, any guesses? During a segment of Koffee With Karan when Ranveer was asked about his worst habit has a boyfriend, the actor said: "I'm never on time and I got to work on my punctuality." When Akshay was asked the same question, he said that he does not pay enough attention to his wife Twinkle Khanna and that's his worst habit as a husband. Ranveer Singh wants be cast with Alia Bhatt and Deepika Padukone in a film together and what could be better than the sequel of Kuch Kuch Hota Hai. Who will be Salman Khan, you may ask. Well, Ranveer thinks, Ranbir Kapoor should have special appearance in the film (as Salman Khan). Will Karan approve of the suggestion? We don't think so. How Twinkle Khanna helped Akshay Kumar take the Koffee hamper home? 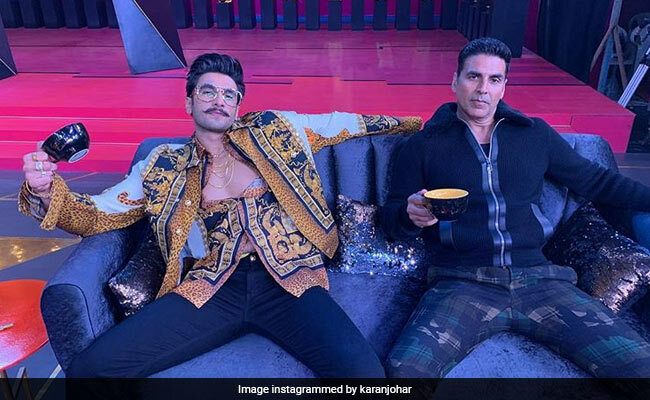 After the rapid fire round was a tie between Ranveer and Akshay, the duo put up a great fight in the ultimate round of Koffee With Karan, the quiz round. As a part of the last task, both the guests had to call three Bollywood actors and whoever answers their call first gets to take the hamper. Initially it appeared that Ranveer was going to take home the trophy but tables turned when Twinkle came to Akshay's rescue and former missed the hamper by a hair.